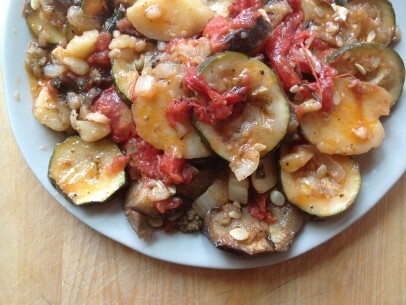 This dish also goes by the name briam from the Turkish version and is also very similar to the traditional French dish ratatouille. Full of flavor and so satisfying, you can enjoy tourlou tourlou hot right from the oven or the next day at room temperature. Serve as a filling meal or as a tasty veggie side dish to just about anything and its a great take for lunch option too! I prefer to use a large ceramic or stoneware casserole dish for this recipe. 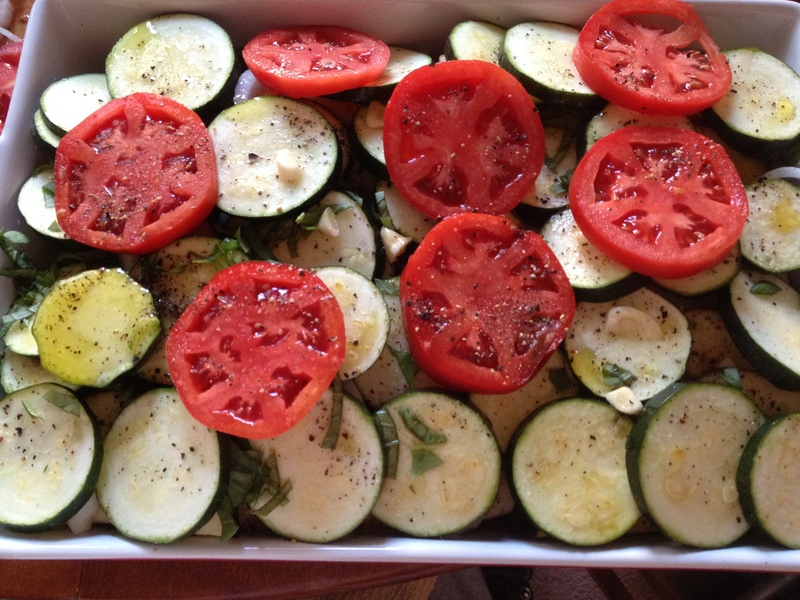 It also works well in a large baking pan or an authentic round Greek pan. Its important, whatever pan you use, to make sure you don’t have more than I’d say 4 inches of layered vegetables. Much more than that and it will not only take forever to cook but some of your lighter vegetables will dry out before the dish is cooked through. My yiayia used the four-finger width rule as her guide and thats another good way to go. Don’t worry about being too exact, just be aware as you’re stacking. It’s often better to use a wider pan to help keep your layer height under control. You can choose to cut your vegetables into chunky, rough cut pieces or into slices. I usually go with slices and not just because I like the finished look better (which I do!) but because the dish cooks quicker and more evenly in my experience. Certainly, if you’re running short on prep time and can keep your tourlou tourlou in the oven an extra half hour or so go with the chunky version – both are just as yummy! And you can also change up your herb options. I usually stick to basil and sometimes add oregano, depending on whats closest at hand, but you can certainly add mint and or dill also. The flavor of course is a bit different but all are equally tasty in their own ways. 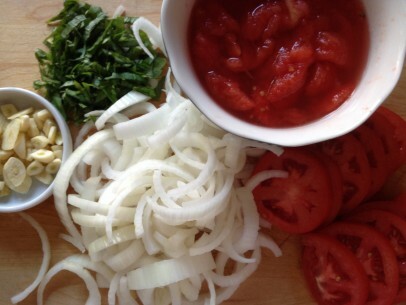 Whatever herbs you choose, make sure to chop them thinly so they are dispersed throughout the dish. You’ll notice that tomatoes are listed twice in the ingredients below. Once is for the tomatoes that will be layered in with all of the other vegetables and the second time for the tomatoes that will be peeled and crushed then mixed with water to pour over the top of your layers. If needed, you can substitute canned, crushed tomatoes in a pinch – just remember to drain off the liquid from the can before adding the water. 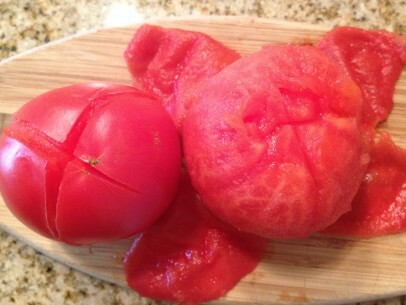 A quick guide to peeling tomatoes: Cut a small cross on the bottom of your tomatoes and add to a pan of boiling water. Remove pan from heat and allow tomatoes to sit for 5 minutes. Remove tomatoes from water and when cool enough to handle, gently peel skin down the sides of tomato from the cross marks. Then just given them a good mash with the back of a fork. And always start your pan with a good coat of olive oil before you begin layering in vegetables. I strongly recommend your first layer always be the potatoes. They’ll take the longest to cook and seem to work best at the very bottom. 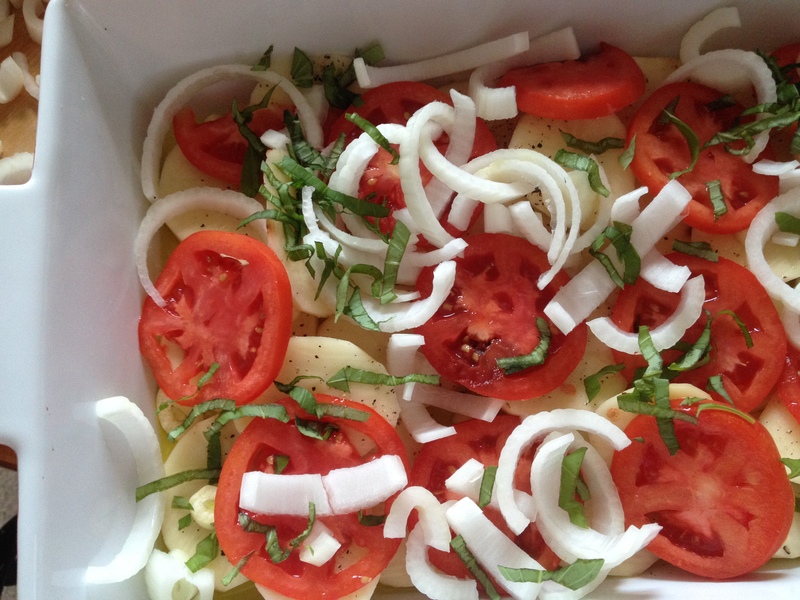 Make sure to add 1/2 your basil, onions, garlic and tomato slices right on top of the potatoes – they just soak all those yummy flavors right in! Peel and crush tomatoes. Add water/pinch of sugar, mix well to combine and set aside. Drizzle top generously with remaining olive oil and pour peeled, crushed tomatoes over the top. Bake uncovered in 400 degree oven for approximately 1 hour and 15 minutes. To test for doneness – check that potatoes are fork tender. You may need to leave dish in the oven another 15 minutes or so depending on the thickness of your slices. 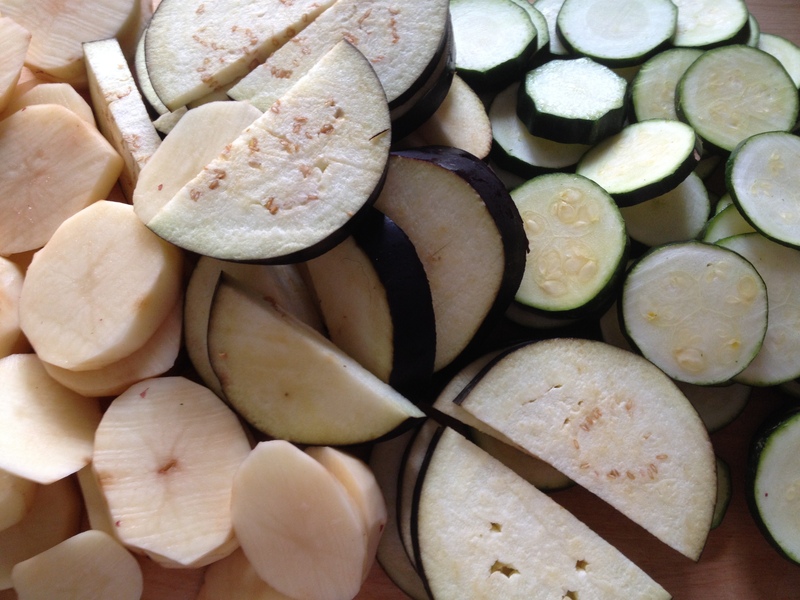 **Increase baking time by approx 20-30 minutes if using chunky cut vegetables instead of sliced. OMG, THIS WAS TO DIE FOR…….MADE IT TWO NIGHTS AGO AND AGAIN THIS EVENING…..THANK YOU!!!! Can you add feta to the recipe? Serving the finished dish with a large piece of feta on top is quite traditional. Please, follow Pernille and I at http://www.theia-cph.dk. We will launch a webshop within soon ! I’ve been looking for a briam recipe that would please my Greek husband for a looong time. It’s hard to find recipes that yield authentic results, but this one is AMAZING! Can’t wait to try your other recipes. You have a new fan! i made something similar to this but sautéed them all in a huge electric skillet. I used a bit of cocoanut oil and a little veggie broth. It was delicious, but am dying to try your baked version .. It looks so good !!! Hello, I cooked this today and my 3year old ate the whole thing. However to make it more childfriendly I also added red peppers, green beans, corn and peas. It is like a rainbow! I love briam but get home from work too late to cook it on weeknights. Can you make this in a crock pot?? I love all your recipes. I have health issues and need to cut the oil-sugars and replace processed flours. (I’m unable to have sweets!) Begeno etsi! I make it in a crockpot and it is delicious. I was hoping it could be crock-adapted. Thank you! This was delicious. It was very easy to make and my family loved it! Thank you!! Yes yes yes! This looks so fantastic! I love a good veggie stew!!! And this looks right up my alley! I had forgotten about tourlou. My mother (her parents were from Istanbul and Aretsou in Turkey) used to make this – or something similar. At any rate. I am going to give it a shot tonight and plan to be wowed. Thank you so much for publishing these wonderful recipes that remind me so much of my family Kiki. Made this except with grape tomatoes and fingerling potatoes because it was all I had… still turned out soooooo delicious. I also made your stewed artichokes. Love these recipes! I made this for dinner tonight. Delicious! I had to cook it for an hour and 45 minutes — maybe due to the size of my vegetable slices. I love your recipes. One of the greatest regrets of my life is that I never learned how to cook Greek food from my Yia Yia. She was a fabulous cook. I am trying to make up for that by teaching myself through you and others who are kind enough to post your family recipes. Thank you! I made this for lunch – it is one of the nicest things I have ever made. Thank you so much for sharing your beautiful food and recipes. Looks delicious. May I please have the crockpot recipe version? Working mom always looking for healthy recipes like this one. Too much oil! Omg! I’m making this without oil. It isn’t necessary.